New and improved for March 2012, thanks to Maury Microwave! A mechanical slide screw-tuner consists of a 50Ω slabline and a capacitive/reflective probe, referred to as a slug. Ideally, when the slug is fully retracted, the tuner presents a 50Ω impedance. As the slug is lowered into the slabline (Y-direction), it interrupts the electric field and creates a capacitance, thereby increasing the magnitude of reflection. As the slug travels along the slabline (X-direction), the phase of the reflection is rotated. It is therefore possible to re-create any and all impedances without the need of discrete components (lumped elements or transmission lines). 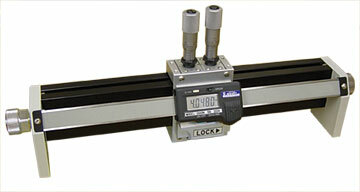 Manual Tuners, or Manual Slide-Screw Tuners, rely on the operator’s hands to vary the position of the probe in both horizontal and vertical positions. 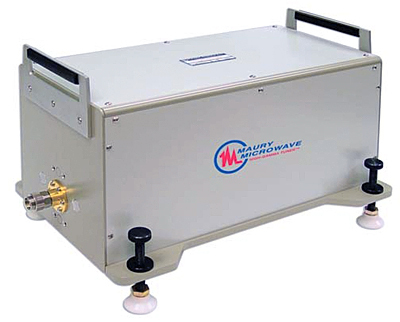 Typical specifications of manual tuners range from 400 MHz to 50 GHz, with power levels between 10W CW / 100W peak and 250W CW / 2500 W peak, and typical maximum VSWR values ranging between 10:1 and 35:1. On low frequency tuners, an LCD readout ensures accurate and repeatable carriage placement over long distances, whereas high-frequency tuners use a micrometer carriage drive for precise probe positioning. Vertical positions are always set via precision micrometer. 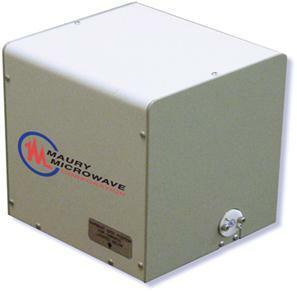 Common manual impedance tuner models include LTE-specific Maury Microwave model 1643L which operates between 600 MHz and 6 GHz with a maximum VSWR of 10:1, mobile communications models 8045N, 2640N and 1643N which operate between 800 MHz and 8 GHz with a maximum VSWR of 25:1, and 8041C and 7941A models capable of operation to 34 GHz and 50 GHz respectively. Like manual impedance tuners, automated impedance tuners operate on slide-screw technology, with the addition of automated motor control. Common computer interfaces include USB and TCP/IP. In the case of TCP/IP control, automated tuners can be controlled directly via an onboard microprocessor using ASCII commands and a Telnet session. In the case of USB control, a driver is used to interface the tuner and computer, and a DLL is used to send commands. Both control types allow simple programming interfaces for custom software development and integration into existing automated test platforms. Additionally, commercial device characterization software is available to drive automated tuners as part of an integrated load pull and/or noise parameter measurement setup. 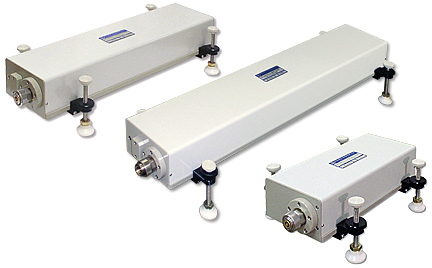 Automated slide screw tuners are available between 100 MHz and 67 GHz in coaxial models, and 33 GHz and 110 GHz in waveguide models. Multi-harmonic impedance tuners are a subset of automated impedance tuners which contain multiple and independent tuning probes. This can be visualized as the physical cascading of multiple tuners, without the interconnection between each. Each probe is wideband in nature, and when lowered into the slabline creates a reflection at the fundamental frequency as well as at multiple harmonic frequencies. Using two wideband probes, it is possible to find unique physical positions for both probes which present the identical fundamental impedance, but varying second harmonic impedances. Similarly, it is possible to control the impedances presented at three frequencies simultaneously by cascading three wideband probes. Note: the impedances presented outside of the frequencies of interest are uncontrolled. Sensor tuners are a subset of automated impedance tuners which contain an integrated low-loss coupler seated between the probe and the connector oriented towards the DUT. Placing a coupler between the tuning element and the DUT allows for the direct reading of forward and reverse powers, or currents and voltages, at the DUT reference plane enabling a style of load pull referred to as Vector Receiver, or Real-Time, Load Pull. As of time of this posting (March 2012), Sensor Tuners are a patented product of Maury Microwave Corporation under patent 7,548,069. Unlike typical slide-screw tuners which have both magnitude and phase control, automated sliding shorts are used to vary the phase of a high mismatch over broad frequency range. With a typical VSWR of 50:1, automated sliding shorts are ideal for constant VSWR applications including harmonic load pull when used in conjunction with a diplexer or triplexer. Load Pull for power devices, which entails varying the impedance presented to the output of an unmatched (non 50ohm) DUT and monitoring some parameter(s) (power, gain, efficiency…) see accompanying Load Pull page. 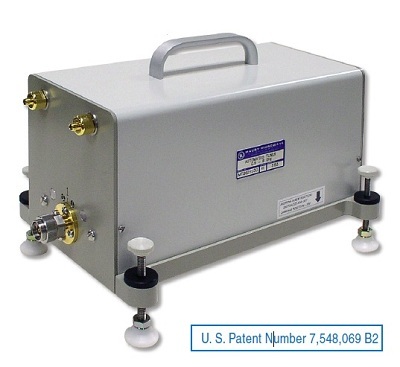 Source Pull for low-noise device, which entails varying the impedance presented to the input of an unmatched (non-50 ohm) DUT and determining Noise Parameters. See our accompanying Source Pull page. Stability testing / conformance testing, which entails varying the VSWR presented to an matched or completed DUT (radio, mobile phone, test board…) and monitoring degradation as a function of mismatch.